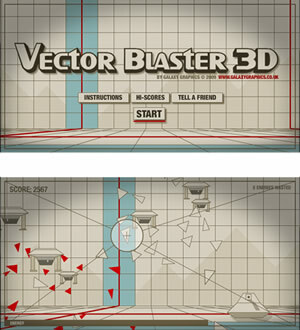 Vector Blaster 3D - A retro-modern styled Flash game designed by Galaxy Graphics. Vector Blaster 3D - A retro style Flash shooter. The thought behind this game was to create a simple shooting game with an apparent 3D effect and retro-modern styling. Taking design inspiration from Battlezone, Intellivision, Tron and Streetfighter IV (the training dojo), the game provides a unique looking experience. The gameplay only consists of aiming with the mouse controlled crosshair and firing. As the game progresses, the aliens multiply and move faster, and there is a risk/reward feature in that whilst lower aliens may hit the ground and sap your energy, shooting lower aliens rewards more points to the player. Whilst the game currently looks monochromatic and retro, there's no reason why your version could not look entirely different. The 3 scrolling "planes" could be swapped out with other graphics, such as jungle or urban landscape, and a sky with clouds placed as the backdrop. The alien invaders on both land and air are then also easily replaced with new designs. Vector Blaster 3D source code. Looking for the source code / Actionscript / .fla file ? The source code for this game is also available to buy from Galaxy Graphics. Click here to contact us about Vector Blaster Source code.